The project is so far progressing adequately and on schedule. Extraction of starch from corn residues and of natural dyes and active compounds from lemon and pomegranate wastes have both been optimized at the laboratory conditions and are now being up-scaled at the facilities of CELABOR, Belgium. On the other hand, purified pigments have already been incorporated in specific laminar nanoclays and their compatibility with biopolyamides and starch blends is being tested. Above: Biopolyamide based 3D-printed truss joint moulds and car pieces. Below: Used residues with active extracts, natural dyes and nanoclays incorporating them. This progress was patent in the expositor of samples exhibited at the premises of the main KTH library, where local and institutional press had the opportunity of taking pictures of tangible results and interviewing the hosting research group of Prof. Vilaplana. 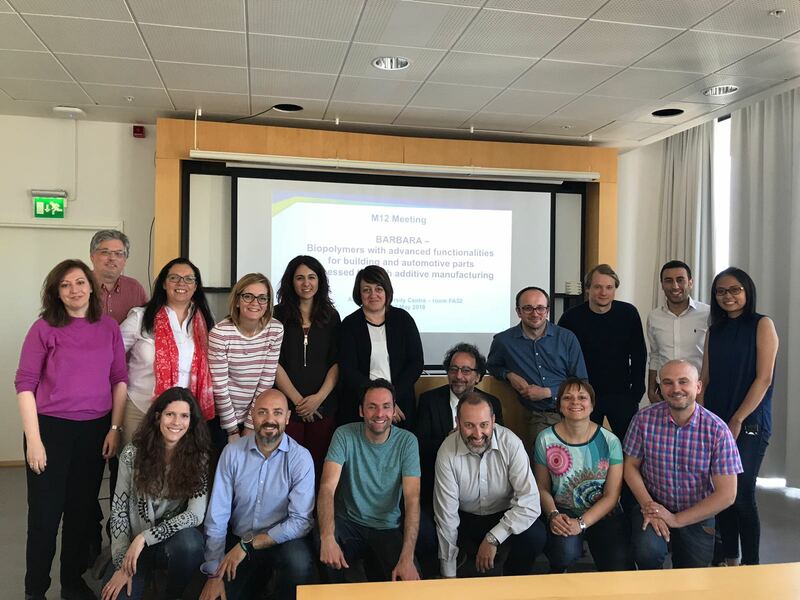 The event was held the next day at AlbaNova University Centre, after which the consortium had the chance to visit the laboratories of the hosting research group and have a first-hand experience of the tasks performed at KTH. The next meeting will be organized by the Belgian company CELABOR next November. We are looking forward to see the next advances! Be updated on the latest news on the Barbara Project, the valorisation of agrowaste and 3D-printing on our social media networks or subscribe to our newsletter and our youtube channel. Follow us on facebook, twitter and linkedin! !